The What: Comprehensive Connectivity Company has introduced the Pro AV/IT HDBaseT 4K@60 (YUV420) 4x4 Matrix Switcher/Extender with Receivers. 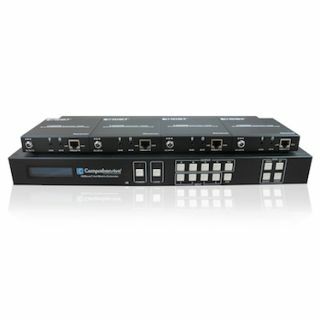 The What Else: Comprehensive’s CSW-HDBT44K330 Matrix Switcher/Extender (CSW-HDBT44K330) offers options to switch up to four HDMI I/O sources, and extends the uncompressed audio/video and data sources over a Cat5e/6/7 cable at a distance up to 330 feet away. The CSW-HDBT44K330 kit features 4x4 HDBaseT matrix switching reliability with compact PoE (Power over Ethernet) Receivers for low form factor behind displays. The Bottom Line: The CSW-HDBT44K330 Matrix extends and delivers HD audio and video, controlled through the bi-directional IR, RS232 on a single Cat5e/6/7 cable that removes the need for additional control and video cables on installations, whether in a residential or commercial setting. Its metal housing was developed for challenging environments.